By Ailbhe Ní Riain | April 15, 2013. Timoleague is a picturesque, colorful and friendly village, situated on the edge of a long sea inlet just 30 miles from Cork city, and within the scenic route between Clonakilty and Kinsale, South-West Cork. Timoleague is a detox from city life, full of fresh air, local produce and outdoor activities. Full of friendly vibes, it’s impossible not to feel serene and relaxed as you walk through Timoleague’s candy coloured streets or just get lost admiring the beauty of the surrounding countryside, its different shades of yellow and green. There is plenty to learn about and do around the village including walking, fishing and exploring the ancient ruins of the historic Abbey. The village is dominated by the ruins of a 13th Century Abbey founded in the 6th century by St. Molaga. Local legend says Molaga spent years trying to build a church along the Argideen River, his actions in vein, until one day he placed a lit a candle on a sheath of corn and left it to float down the river until it came to shore along the banks of a rural settlement. Molaga built the church and his house there, and so was born the village of Tigh Molaga, (House of Molaga). Tigh Molaga now known as Timoleague adopted its English name during the plantations of the 17th Century when the Travers family took over the land. In 1612 the stained glass windows of the Abbey were smashed by British soldier after troubles broke out between sides of the Irish and the Queen. 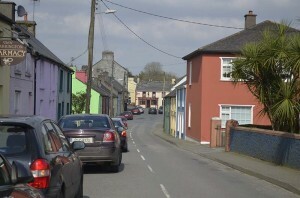 Timoleague’s neighbouring village and towns also provide tourists with plenty to do and to see. From horse-riding, sailing, fishing or wind surfing in Courtmacsherry to the Model Railway Village or the Michael Collins Centre in Clonakilty. There are countless beaches along the South-West coast of Cork. Two family friendly beaches are Dumwhorley and Simons Cove, which are only kilometers away from Timoleague itself. Dumwhorley is brilliant for swimming, body boarding and rock pool fishing. Simons Cove, a true hidden beauty of West Cork is known for its calm and clear natural swimming pool. Each year the village hosts an annual harvest festival which sees the village packed with locals and tourists alike, joining in on the many street activities organized for the event. Popular street activities include pig racing, fancy dress competitions,parades, dog shows, live street music and many more. A large marquee is erected on the village green with many big name acts performing over the 10 day period. Timoleague will be celebrating the 40th anniversary of their annual festival from the 16th -24th of August this Summer. A birthday party will be held on Saturday the 17th to celebrate the anniversary. DJ Jenny Greene and singer/songwriter Rebecca Storm are two acts confirmed for this year’s festival. There are a number of B&Bs to stay at in Timoleague including Panorama House, Kilgatten House and Lettercollum House. Houses can be rented out for short or week long stays. The photo of this article was changed at 20:22 on 25th April 2013. It was mistakenly tagged as a photo from Timoleague, it was infact a photo of Clonakilty as it’s Model Railway Choochoo train ran through the town on a tour.